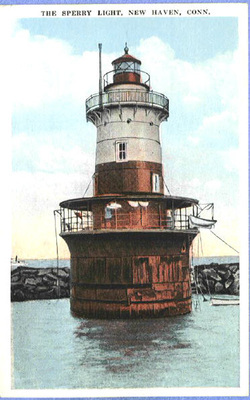 After appropriations in 1897-98 for a total of $75,000, the Outer Breakwall Light was built in 1899. The name of the lighthouse officially became New Haven Light in 1912, but it was popularly known as the Sperry Light after Congressman Nehemiah Sperry, who was responsible for much development of New Haven Harbor. A 1948 letter from John E. Post in the New Haven Register described the towing of the iron foundation cylinder to the lighthouse site: "It was lashed securely to one end of a large square scow and at high tide the tugboat James H. Hogan (Captain Edgar S. Dowe) took it in tow to the location where it now stands." There were construction problems when it was found that the bottom sediment was softer than anticipated. The site was dredged and filled with gravel. Then the foundation cylinder, filled with cement, was lowered into place. According to Post's 1948 letter, a worker fell into the cylinder during construction and was drowned. Trapped air ruptured the bottom seal of the cylinder, which quickly sank and landed at an extreme tilt. The structure was righted and the cast-iron lighthouse was built on top, and a flashing red light was exhibited from a fourth-order Fresnel lens 61 feet above sea level for the first time in January 1900. Travel to and from the lighthouse was often difficult, especially in the winter months. To ease the isolation of the keepers, for some years representatives of the Seamen's Bethel in New Haven made regular trips to the lighthouse to deliver newspapers and magazines. One day in January 1907, Keeper Samuel Armour left the lighthouse to row ashore for supplies. As he prepared to head back to the station in the early evening, a storm was worsening and the seas were growing rough. A New Haven man suggested that Armour spend the night on shore, but he felt he needed to return because the assistant keeper was in the hospital. Armour set out in his 15-foot rowboat. The captain of a British schooner later reported seeing the rowboat overturned near Southwest Ledge Lighthouse, but Armour was never seen again. The station's powerful fog siren had to be replaced by a weaker one; its intense vibrations were causing damage to the structure's foundation. The lack of a strong fog signal may have been responsible for an accident in which three barges sank near the lighthouse. Another wreck occurred in November 1911 when the schooner Witch Hazel struck the outer breakwall and sank during a storm, killing four crew members. By 1907, several cracks were found in the foundation and the lighthouse began to tilt. The cracks were filled and the tower was righted and reinforced with iron straps, allowing the lighthouse to remain operational until 1933, when it was replaced by an automatic skeleton tower. I visited the site of this fallen sentinel. After almost 70 years of neglect the caission foundation is like an old barrel with split sides. You can see the gaping cracks in the cast iron and the straps used to mend them. The cement that once filled the caisson is not much more than loose gravel and sand. There is some brickwork that was either the cistern or the septic system. There are rusty pipes and what must be reinforcing rods that were in the cement. It's ironic that the foundation that failed and doomed the lighthouse is the only thing that remains. All of this happened in 1933, before even my parents' time. I grew up looking at these breakwalls all my life and never even knew there was once a lighthouse there. The view from out there is pretty and you can stroll along the west breakwall which is a medium-difficult hike. It is mostly smooth with a few bites taken out from storms. The breakwall looks like it was topped off with new granite at some time, because the edges look a little too sharp for over 100 years of weather. The skeleton tower has been replaced at least once. The modern plastic lens and the solar cells are definitely recent. You can see the Southwest Ledge Lighthouse two breakwalls down, and marvel at how good it looks especially since it is older than Sperry or the breakwalls themselves. I am saddened that this lighthouse could not have been saved, but I know after looking at the remains of the foundation that it was best to tear it down before the 1938 hurricane which would have almost certainly destroyed the lighthouse and probably have killed the poor keepers inside.